The project consists of a core group of student interviewers, who have conversations with alumni who have volunteered to share their experiences on campus. There are currently 20 finished interviews, and the project aims to record 40 to 50 per year. Kelly Bonnevie ’87 became involved in the project after discovering it through DGALA’s Facebook group. Rev. Nancy Vogele ’85, another participant in the project, has worked in the William Jewett Tucker Center as director of religious and spiritual life since 2013. Vogele met with Caroline Casey ’21 last spring for her interview, but she asked to re-conduct it this fall. “I had gotten so much clearer about some stuff,” she said. Vogele’s Dartmouth experience was framed around finding her identity within her different roles. She wanted to figure out how she fit in as a Christian, a student and a woman during a time when the College was capped at 40 percent female. When she returned in 2001 to talk to the dean for LGBT life at the College after working as the rector at a White River Junction church, she was astounded there was such a position in existence. “It showed me how much the culture [of the country] changed and how much the institution changed,” she said. Mac Neill emphasized that there is certainly not a one-size fits all rubric for these oral histories. Mac Neill has background in working on oral histories and as part of his job assembles a reading list for students to understand methodology for the special type of historical collection. 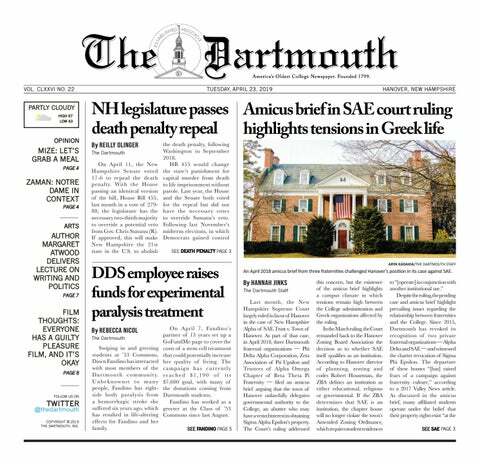 Millett’s goal was “to make sure that at least historically there was some sort of account of what Dartmouth used to be like, juxtaposed to what it’s like now.” In 2011, when he came back to campus for the first time since the 1990s, he noticed the change on campus and the shift in diversity for the better. Many alumni mentioned the gratitude they had for their experience at Dartmouth. They referenced anything from the education or financial aid, the hardening confidence it gave them, or the chance to explore and develop.